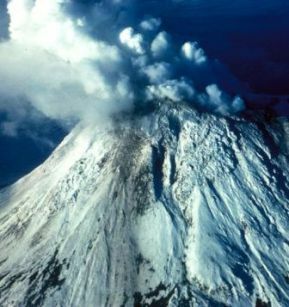 Augustine Volcano is a Lava Dome Complex on Augustine Island in southwestern Cook Inlet in the Kenai Peninsula Borough of southcentral coastal Alaska, 280 kilometers (174 mi) southwest of Anchorage. Due to its remote location on an uninhabited Island, the explosive activity of Augustine poses little direct threat to humans. However, Augustine has repeatedly been the site of large debris avalanches which have not only reshaped the island, but have also resulted in tsunamis which pose a significant threat to coastal communities in the area. 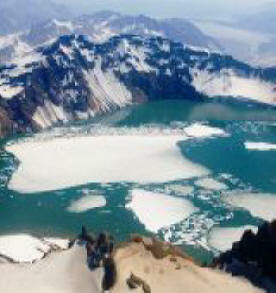 Tsunamis account for around 25% of total fatalities caused by volcanic activity worldwide in the last 250 years. Volcanoes can produce tsunamis by various mechanisms, such as volcano-tectonic activity, subsurface eruptions, aerial shockwaves from powerful explosive eruptions passing over water, and displacement of water by entry of large volumes of volcanic material into the sea. The two most recent collapse events at Augustine occurred around 450 years ago, forming the West Island deposit, and in 1883, forming the Burr Point deposit at the north of the island. Historical accounts of the 1883 event and resulting tsunami exist and have been compared to mathematical models. 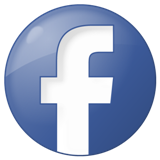 Little is known about the exact sequence of events at Augustine on October 6th 1883. Eyewitnesses at English Bay 80km NE of the volcano, spoke of a great eruption which was followed by a series of 4 approximately 7m high waves. The waves carried away fishing boats and flooded houses near the seafront, yet no fatalities occurred. This can be accounted for by the fortunate fact that the eruption coincided with low tide. The tidal range in the area is exceptionally high (about 5m), so the wave was only 2m above the high tide mark. Inspection of the edifice after the eruption revealed a horseshoe crater, typical of flank collapse events, with an estimated volume of 0.5km. More recent underwater studies reveal that the Burr Point avalanche extended 5km beyond the shoreline of Augustine Island. 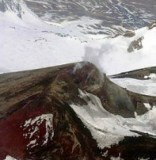 In mid-December 2005 a sulfur dioxide-laden plume of steam, hundreds of miniature earthquakes and a new coating of ash over its currently snow-clad peak, suggested that Augustine was building to a new eruption. 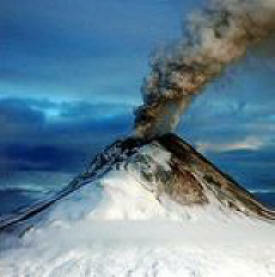 The eruption consisted of four "phases", continuing from December to March 2006. 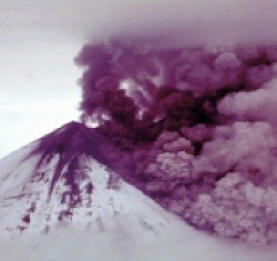 The first stage of the eruption began when micro-earthquake activity, tiny earthquake that suggest a volcanic eruption could possibly occur, increased steadily from May to December 2005. At first, they started out at around 2 each day to around 15 each day. 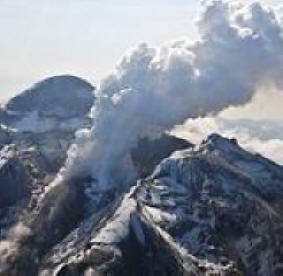 On January 16, a new lava dome was observed on the summit; and the next day another explosive eruption sent ash 13 km (8 mi) into the atmosphere. This explosion created a 20-30 meter wide crater in the new lava dome. 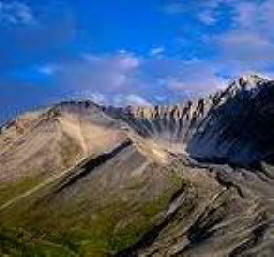 On September 22, 2007, the Alaska Volcano Observatory reported that shallow earthquake activity had increased over the week of September 22. 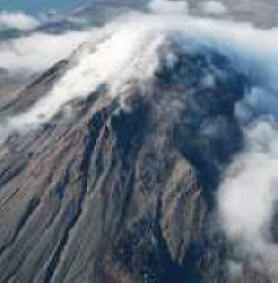 However, the activity was less than its level during the months leading up to the 2005-2006 eruption.